In this new hardcover, evil spreads across Gotham City as Batmans allies, including Red Robin, Batwing, Robin, Batgirl, the Birds of Prey, Nightwing and even Catwoman find themselves in a battle coming from all sides. 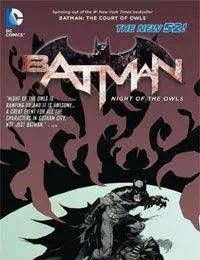 The Court of Owls makes its move against justice in this sprawling tale of corruption and violence. Collects BATMAN #8-9, BATMAN ANNUAL #1, DETECTIVE COMICS #9, BATMAN: THE DARK KNIGHT #9, BATWING #9, BATMAN AND ROBIN #9, RED HOOD AND THE OUTLAWS #9, BIRDS OF PREY #9, BATGIRL #9, NIGHTWING #8-9 and ALL-STAR WESTERN #9.